CCM Skipton’s annual pedigree beef season commenced with ‘Blue Wednesday’, the pedigree British Blue showpiece, which was dominated by breeders from North Craven. The supreme championship fell to Sheila Mason’s Keasden herd in Clapham, with Keasden Head George Harpon, a two-year-old son of Harpon De L’Orgelot, out of Bringlee Doubliette, one of the herd’s best brood cows. The well-muscled bull, already a proven performer, having served heifers in calf, joined regular Malhamdale buyer Jeff Burrows, of Flatt House Farm, Hanlith, for joint top price of 3,100gns (£3,255) and will be put to good use on his British Blue and Limousin suckler herd. Sheila Mason, of Keasden Head Farm, who also presented the champion at Skipton Auction Mart’s annual Spring show and sale of young feeding bulls in March, is regularly among the leading prices in the commercial feeding bull ring. Back at the British Blue highlight, the other joint top price fell to Owlden Granite, a mobile and modern blue and white bull just one day shy of his second birthday, from James and Deborah Ogden of Owlett Hall Farm, Austwick. The son of Ballygrange Alex, bred from a cow by Tamhorn Venture, sold to Jim and Christine Scriven, of Park House Farm, Elslack, and will again be used for commercial breeding on their Limousin-cross suckler cows. The reserve champion, another bull, also came from Keasden – the High Moss holding of brothers Jack and Tom Wallbank, with High Moss Funtime, a March, 2009-born son of Empire D’Ochain, out of the herd’s leading brood cow, Woodview Wanda. The runner-up – the Wallbanks also presented last year’s reserve champion – sold for 2,200gns (£2,310) to Jim Blake, of Lower Red Lees Farm, Burnley, and will be put to work on his British Blue-cross cows. 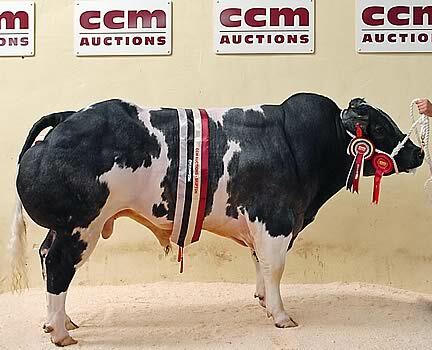 George and John Stapleton, who run the Craven herd at High Skibeden Farm, Skipton, received strong support for their consignment of sound, workmanlike bulls, with a home-bred 2011 son of Eclatant de la Sucrerie making 2,850gns (£2,992) when joining Bernard Simpson, of Heathfield, Pateley Bridge. The Stapletons also sold a second home-bred two-year-old Eclatant son to P&RM Sutcliffe, of Queensbury. Ken Gamble, of Brickyard Farm, Easingwold, a familiar face at the fixture, stepped up with three two-year-old sons from his show-winning stock bull Bringlee Clint, which all sold well at 2,150gns (£2,257), 2,000gns (£2,100) and 1,950gns (£2,047). The leading performer on price joined A Waterfield in Rochdale. Richard Maudsley, of the Littlebank herd in Rathmell, presented the first prize female, a home-bred December, 2010-born daughter of the renowned Bluegrass Cyclone. She returned home and can look forward to another opportunity in the sale ring. Of the 12 pedigree males forward, senior bulls averaged £2,205 and junior bulls £2,468. Judges were Edward Parkinson, of Dunsop Bridge, and John Atkinson, of Bleasdale. Roller door firm Mendore sponsored. CCM Skipton’s pedigree beef season continues with the two-day Limousin fixture on Tuesday and Wednesday, May 14 and 15 – the Northern Limousin Extravaganza followed by the Spring show and sale of pedigree Limousin bulls and females. The curtain falls on Wednesday, May 29, with the Ling Fields Beef Cattle Fair, the annual multi-breed show and sale of pedigree beef breeding cattle, coupled with the late Spring sale of breeding bulls.